My wife is in Chicago on business. What that usually means is that it’s either time for me to make a major purchase without influencing her ahead of time (may be how the second Xbox appeared in our home), it’s time to rearrange the furniture in the house, or it’s time to make a shitload of food. Given that I was feeling too lazy to muscle the couch across our awkwardly shaped living room, and my lovely wife threatened me with castration if she found an Xbox One under our TV upon her return, I opted for the third route. After a shopping trip with a pretty hefty price tag, I set to work making two bolognese ragus. The first featured ground chuck, pork and venison, and the second almost three pounds of whole chuck roast. 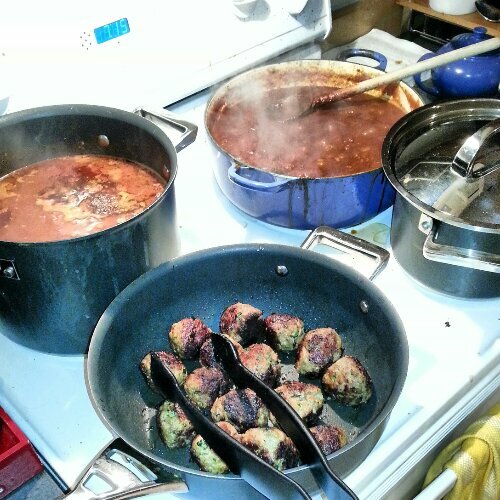 I also whipped up a batch of meatballs, also featuring chuck, venison, pork, and just a bit of spicy Italian sausage. I couldn’t help making a batch of spinach pasta, which I look forward to rolling out after work tomorrow. I’ll post the recipes when I have the time to write them up, but all in all, I’d say it was a pretty productive Sunday.